With every gift you give or receive, give a gift to our planet by reducing waste and reusing gift wrapping materials. Not only will you save money, but you will also be contributing to save our planet. Did you know if every family reused just two feet of holiday ribbon, the 38,000 miles of ribbon saved could tie a bow around the entire planet? If every American family wrapped just 3 presents in re-used materials, it would save enough paper to cover 45,000 football fields. The 2.65 billion Christmas cards sold each year in the U.S. could fill a football field 10 stories high. If every person sent one less card, approximately 19 million pounds of paper would be saved which is the equivalent of 160,000 trees. Be creative. Find alternatives to wrapping in new wrapping paper. A gift wrapped in something interesting such as magazines, scarves, children’s drawings for example, is going to get grab more attention that ordinary holiday paper. If you are shopping for gift-wrap, try and find paper containing the highest percentage of recycled content. Say no to retail store boxes. Use cereal, pasta, shoe, other household boxes and containers to package gifts. It will also help add to the element of surprise. Forget the bow. Bows use a lot of ribbon and there are more creative ways to enhance a gift then a ribbon bow. Find decorative items to attach to the top of the box to enhance the gift. Save all wrapping paper, tissue, ribbons, gift bags and boxes you receive and reuse them. In the past, it was considered in bad taste to reuse gift wrapping but now that our environmental awareness has changed, rewrapping gifts with used gift-wrap, cards and ribbons has become the stylish thing to do. 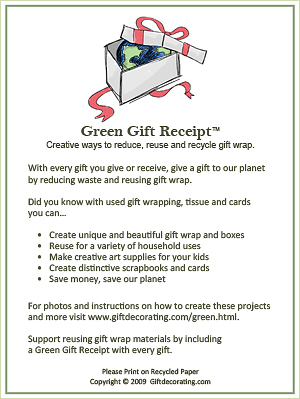 Support reusing and recycling gift wrap materials by including a Green Gift Receipt with every gift you give so you can build awareness on how to reuse gift wrapping supplies. 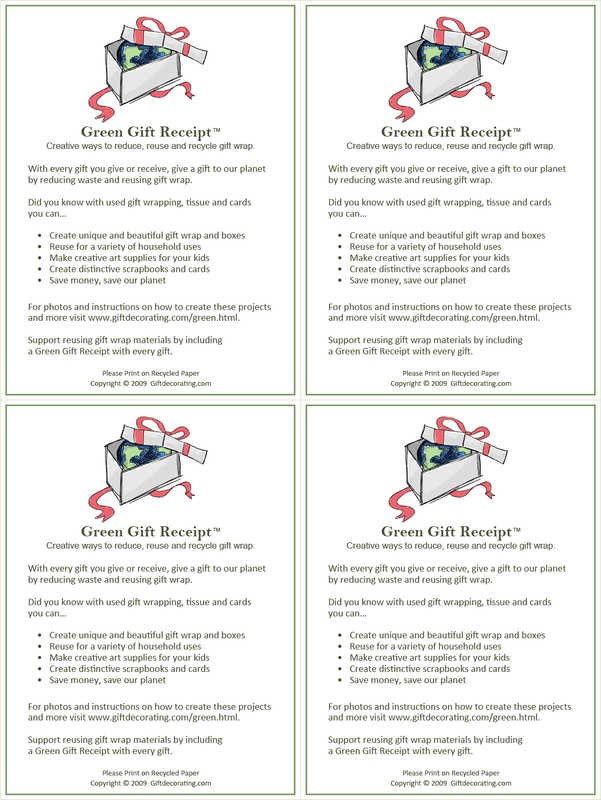 Click here to download a printable Green Gift Receipt. Please print on recycled paper.